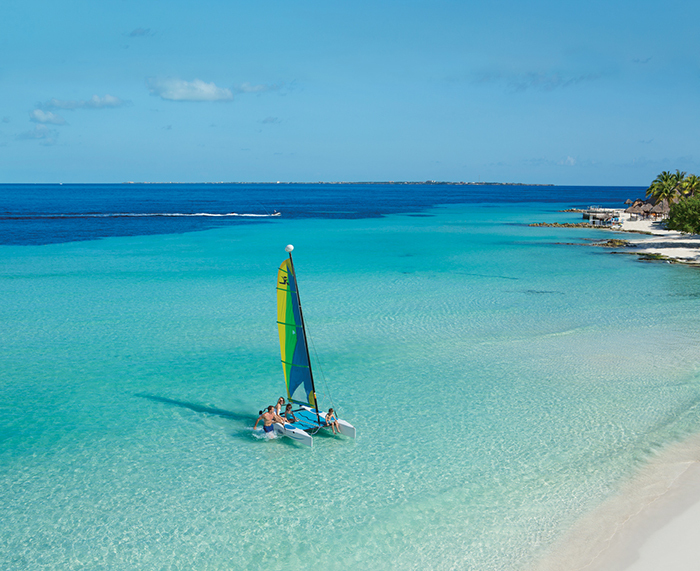 Planning your All Inclusive Trip should be easy and fun! With available low rates for large groups, we make this process a breeze. 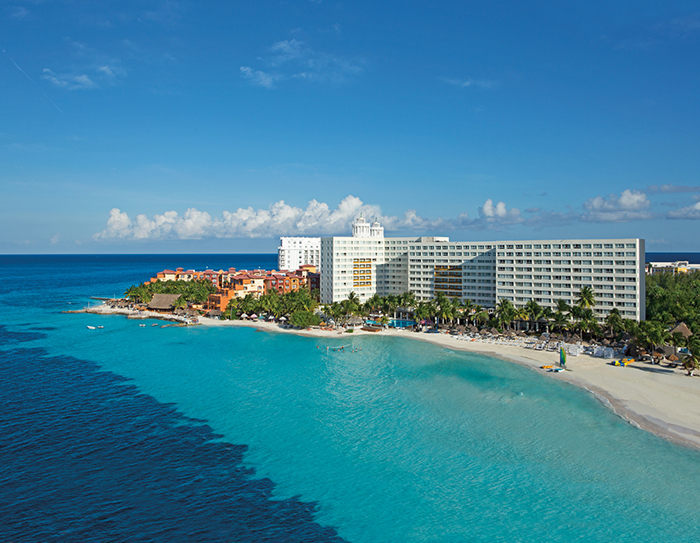 Considered to be one of the best hotels in Cancun, Mexico, Dreams Sands Cancun has separated itself from the pack as the ideal beach vacation spot in the country. People leave this resort feeling rejuvenated and relaxed, thus allowing them to readjust their lives before having to return to the workplace. Dreams Sands Cancun Resort & Spa has become a must see for any vacation enthusiast in the world, for this piece of paradise is able to fit any budget, group size, or interest. It can be difficult to find the right resort when searching on the internet for all inclusive trips to Cancun, but we can say that when you choose Sands, you will most definitely be leaving in the preferred state of mind. There are no head-aches, or stressful days down here, but rather days of sunshine and beach dwelling. Guests of all ages are able to stay occupied during their stay at Dreams Sands Cancun, because the resort offers its guests many activities. So whether you’re a bachelor party, a family reunion, or a 60 year anniversary party, Dreams sands has something for you! Nestled in the heart of the Hotel Zone in Cancun, guests are within minutes of popular restaurants, shopping areas, bars, and only about 15 minutes from the lively Cancun strip of Mexico. 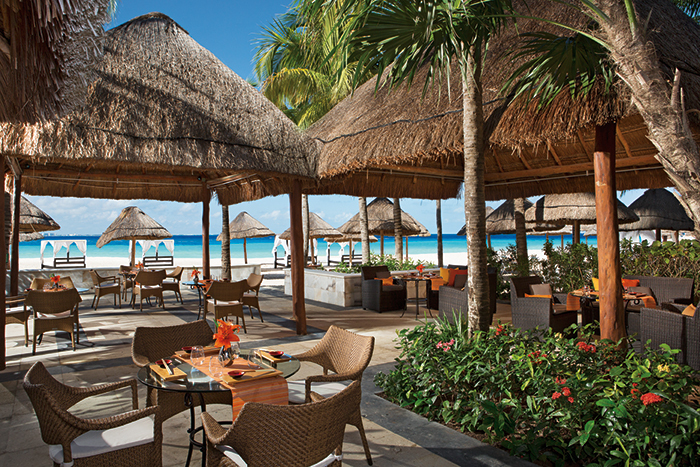 The resort offers nightly entertainment, quality meals, and an impressive array of different liquor choices. You can either drink locally, or have the bartenders pour up your favorite top shelf vodka drink. And at Dreams Sands Cancun, guests are able to enjoy non stop transfers, total access to gourmet dining, and endless top shelf liquors! 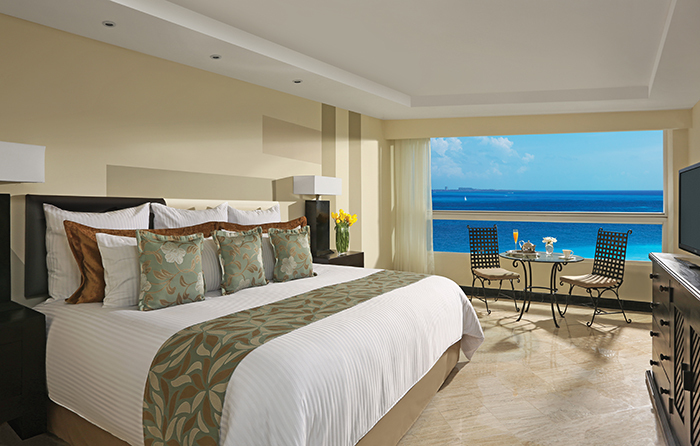 Are you looking for a sensational view of the Caribbean Sea? 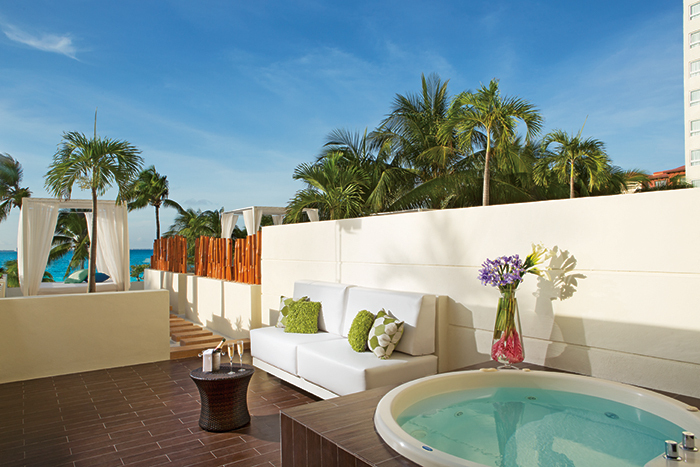 Then you needn’t go any further than the comfort of your own resort room balcony by contacting us for a group deal to Cancun. The views of this part of the Mexican Caribbean are some of the most legendary in all of Mexico, so having the option of walking 10 feet from your bed to the balcony is an incredible feeling. There’s an electricity in the air at Dreams Sands Cancun and we want every client to have the same incredible experience that our previous guests have had. Guests have the option of dining at any of the eight dazzling restaurants; try a meal at the International Buffet, a gourmet Italian dinner at Portofino, a Pan-Asian experience at Himitsu, or intricate French cuisine at Bordeaux. After taking a swim in the crystal clear water, wander over to the Barefoot Grill and taste some of the barbecue snacks that chefs are preparing daily. Also, those who are looking to grab a quick bite before heading out on the waves should take advantage of the Coco Cafe, for they have amazing coffee, tea, and deli snacks that will keep you fueled for your afternoon of relaxation and blissful vacationing. When choosing the right vacation, you need to choose a reliable and organized service, which are two things we do very well. Each vacation package is carefully designed to adhere to all types of groups, from large groups to honeymooners, we ensure a stress free vacation for all our clients. Next, you need to find hotel that can accommodate your party and ultimately make them feel as if they’ve entered a five star resort at all times. 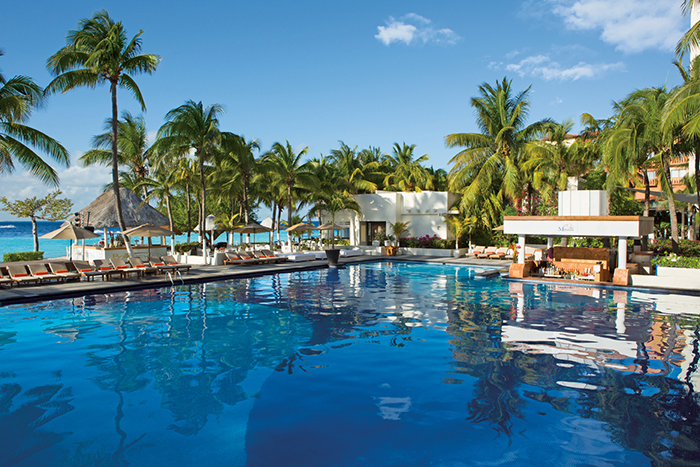 Dreams Sands Cancun Group Rates are affordable and competitive with other organizations, though we typically go one step further in creating a comfortable atmosphere for our guests. Group travel to Cancun can make the difference between a mediocre vacation and an experience that will be remembered forever. We excel in creating once in a lifetime experiences and invite you to join us as we plan your ultimate vacation. Apart from the epic spa accommodations at Pevonia, memorable views at Playa Mujeres Golf Club, and variety of offered water sports, Dreams Sands Cancun provides guests with comfortable and enjoyable rooms of all shapes and sizes. From families that are looking for multiple room suites to couples that want a romantic setting, we are capable of providing our clients with the perfect room accommodations. Once you book your next vacation to Mexico using our knowledgeable expertise, you can expect to experience the luxury treatment you’ve always dreamed of. Poolside margaritas, beach front mojitos, and a whole lot of tequila, rum, vodka, whisky, or anything you can imagine. The bartenders and chefs at Dreams Sands Cancun have been trained to execute only the best cocktails and cuisine for all guests. We want to provide our guests with once in a lifetime experiences that will remain pleasant memories for years to come. That is why we’ve taken the liberty of designing vacations that please our clients and have them returning year after year for their annual Mexico vacation. Our travel experts have spent countless hours researching, developing, and creating world class vacation packages that will satisfy just about everyone. There is no reason to wait another moment to book your next vacation to Cancun, Mexico! Our representatives are ready to answer any questions or concerns you may have about Dreams Sands Cancun in Cancun, Mexico.